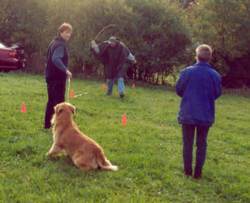 #1) A friendly stranger meets and greats the handler, no attention is paid to the dog. 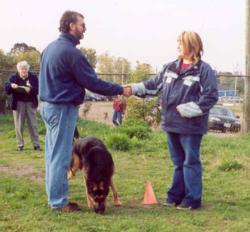 Instructions to the handler are given at this station. 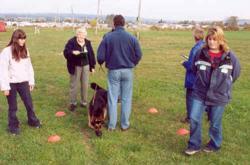 #3) The dog and handler enter an area and remain there while several people approach from all directions. #3a) These people just stand there for a few moments so that the examiners can gauge the response. 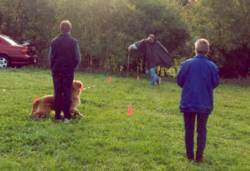 #4) The dogs response to loud and unusual noises is assessed. A person rattles a tin pail with several stones. He then sits the pail on the ground. The dog is expected to investigate. 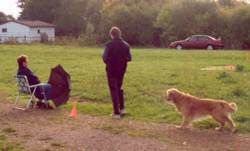 A shot is fired from behind a van once the dog leaves. Two quick shots follow, again from a gunman in hiding. 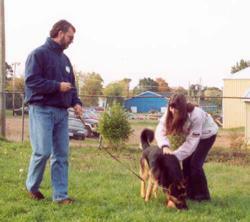 #5) The dog and handler approach a person seated in a chair with an umbrella. When the team get close to the chair the umbrella is opened quickly. Most dogs are startled by this but then come over to sniff and investigate. In #7 a drunken stranger appears from behind a parked car. This fellow wears a rain cape, has a whip and is using a loud voice demanding that someone call him a taxi. 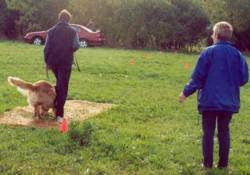 He approaches the dog banging his whip on the ground but stops approx 10 feet from the dog. 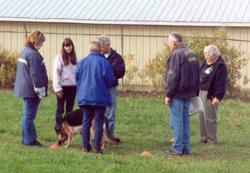 He then stands quietly for about 5 seconds so that the dogs recovery can be assessed.